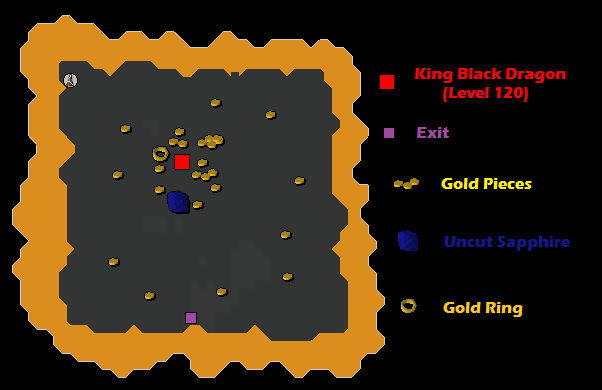 This dungeon is located in Level 42 of the Wilderness and is home to one of the meanest, strongest dragons around... the King Black Dragon! Despite the dangers, many players find hunting the "KBD" worthwhile and profitable. It is normally killed as there is a rare chance it can drop a Draconic Visage or Dragon Rider boots and gloves. 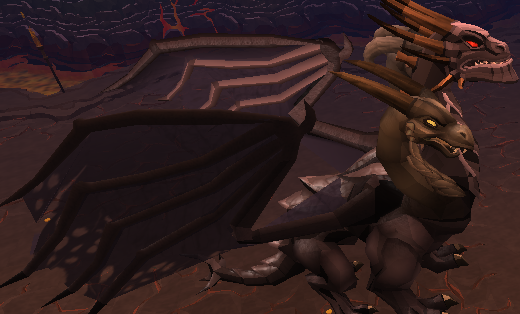 If you are assigned a Black Dragon task for Slayer, higher levels may want to consider killing the King Black Dragon for the task, due to its charm drops and money per kill potential. There are Wilderness and non-Wilderness methods to reaching the lair. 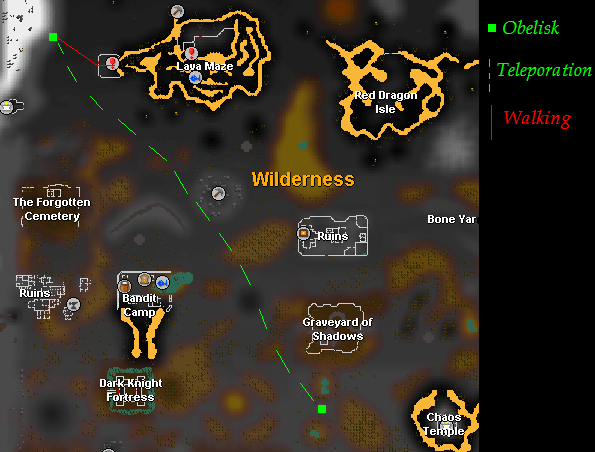 If you do enter through the Wilderness, you will be rewarded with a 10% damage boost for your whole trip! Northwest of the Edgeville Lodestone, you will find an artefact. When you activate it, you will be teleported directly to the lair without having to travel through the Wilderness and risk losing your combat gear! The only downside is that you will not receive the 10% bonus that you could have, had you used the Wilderness. 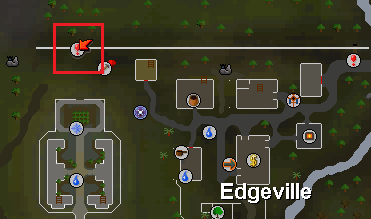 Another way to reach the KBD is using a lever near the border of East and West Ardougne (often used in the Mage Arena Activity) which teleports you to the Deserted Keep. There will be a spider web in the way, but the knife on your toolbelt will take care of that. From there, you can walk to the dungeon following the map. 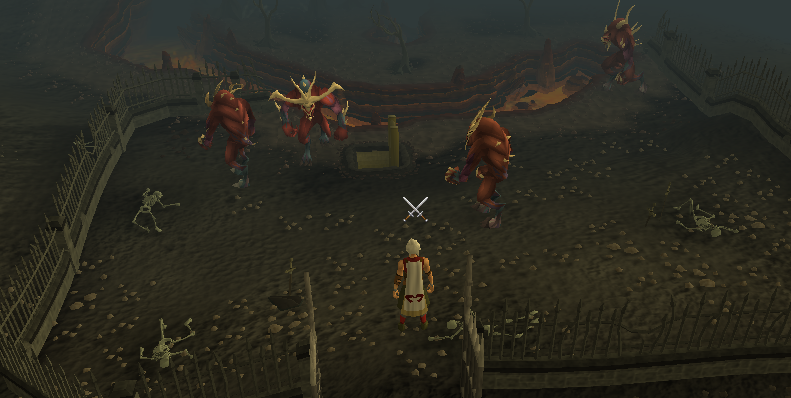 Another way to get to the KBD is by using the ever so useful Obelisks that are scattered throughout the Wilderness. 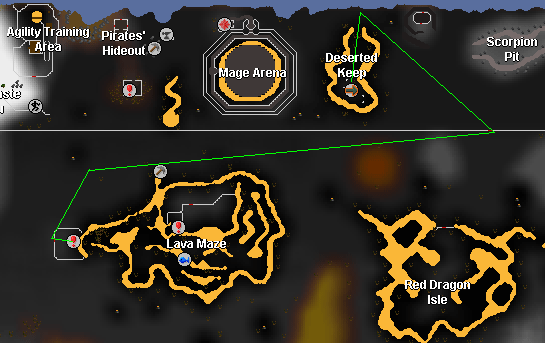 There is one located northeast of Edgeville, which can teleport you to another Obelisk which is located west of the KBD. Be aware that player killers may also be using the Obelisk network and can come out of nowhere. Make sure your auto-retaliate is off. Whenever using the Obelisk near Edgeville, click the northwest tower on it. Run past the Lesser Demons, go down the ladder, and you will find yourself in a small room filled with Poison Spiders (level 90). Now, to avoid being poisoned, don't bother killing them, just quickly run and pull the lever located on the wall adjacent to you. You may want to bring an antipoison just in case, also considering the King Black Dragon can poison you later on. After pulling the lever, you will then be teleported into the dragon's lair. Be careful! 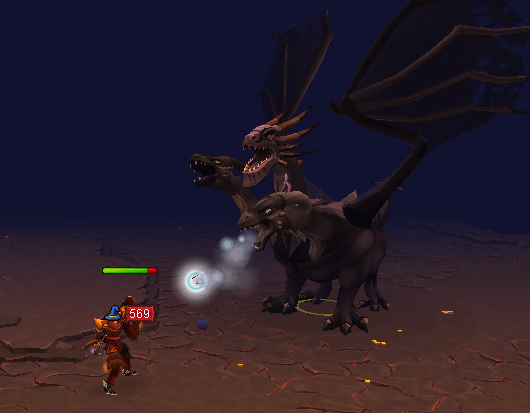 If the KBD sees you, he will attack you with a variety of magical attacks, such as his deadly fire blast, or a blast that will poison you. He can hit for very high damage, so I suggest you bring food (lobsters and up are a must), maybe some Prayer Potions, an Antipoison, Antifire or Super Antifire potion, and a method of teleportation. Don't forget to bring an Anti-Dragon Shield or Dragonfire Shield either! The main feature of the dungeon is of course, the King Black Dragon. He spawns toward the northern side of the dungeon, near the middle. To the east of him, there are several chests containing a variety of items.